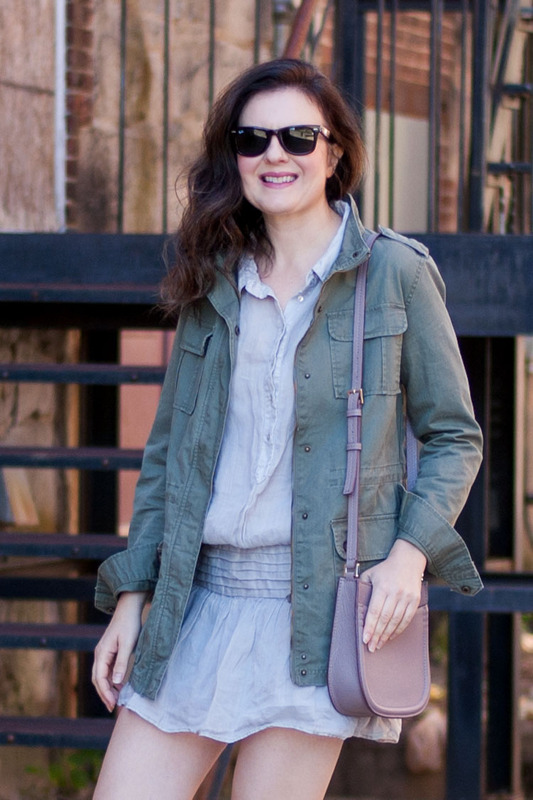 A military jacket has been my staple outerwear for fall and spring for years now. I bought my first one in Amsterdam years ago (I remember that at the time people were already wearing them in Europe, but they were really hard to find in the US). But in a moment of “I need to purge my closet of old stuff” last summer, I donated it. I regretted it almost immediately as I started seeing stylish moms at the playground looking stylish and happy in their own military jackets. And since then I had been on a hunt to replace it. Luckily, I spotted this one recently at Target. I love the slim cut. For me a military jacket is so versatile. It works with any color jeans. And I especially love pairing it with dresses. There is something so appealing about wearing what is essentially a man’s jacket and throwing a feminine dress under it. I love it with a short dress, and here I’ve completed the look with chunky boots. But I would also love to wear it with a long, flowy dress. Maybe in spring.